Sleep Watch tracks and records your sleep hours, restful sleep, and heart rate while you sleep. All you need to do is wear the Apple Watch to bed. The app automatically detects your sleep patterns for you. Sleep Watch has several complications you can use for easy access to your sleep information. On the Modular face, the large center complication will tell you how many hours and minutes you slept last night as well as your sleeping heart rate. The small circular complication is not informational but rather a shortcut, a moon and star icon. 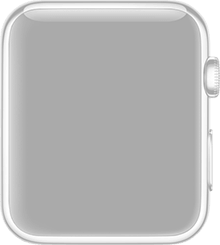 The one-line complication on faces like Mickey, Numeral, and Utility gives you the number of hours and minutes you slept last night. When you open Sleep Watch on your Apple Watch, you’ll see detailed information about your previous night’s sleep. LAST NIGHT tells you what time you fell asleep and what time you woke up. SLEEP tells you how close you got your sleep goal, which is eight hours by default but can be altered in the iPhone app. SLEEP CHARGE is an average of the past three nights’ sleep. SLEEP HR AVG is your average heart rate while sleeping. RESTFUL SLEEP tells you how many of your sleeping hours were spent sleeping restfully as opposed to tossing and turning. Below that, you’ll see a chart of your night, with the darker sections indicating when you slept restfully and the white sections showing when you did not. You can Force Touch to refresh your results at any time. The app on the Apple Watch shows you only your sleep information for the previous night. Open Sleep Watch on your iPhone to see your sleep history, charts, averages, and more. You can sync Sleep Watch to the Health app if you wish. I tracked my sleep for a week and found Sleep Watch to be remarkably accurate overall. It did make one error, for some reason when I was watching a movie, it thought I was sleeping (I wasn’t, I swear!) You can easily edit your sleep hours in the app on your iPhone, so I was able to delete that movie-watching time from that night’s sleep recording with a swipe and a tap. There was also a night I forgot to wear my Apple Watch until I woke up in the middle of the night, so I was able to add that sleep in manually after the fact. Sleep Watch is $4.99 on the App Store. Remember to set up your watch in sleep mode so that you aren’t disturbed by the watch while you’re sleeping.